From the heart of Northern Italy's Pianura Padana, or Po Valley region, Grana Padano is a cheese like no other. Complex and fragrant, with a savoury tang, it works equally well shaved into salads and risottos, sprinkled over pasta and soups, incorporated into canapés, pastries and sauces, or served simply, in all its flavoursome splendour, as the hero of a lavish cheeseboard. In fact it's this versatility that makes Grana Padano an essential addition to your festive food shopping list. Authentic Grana Padano is easy to spot. 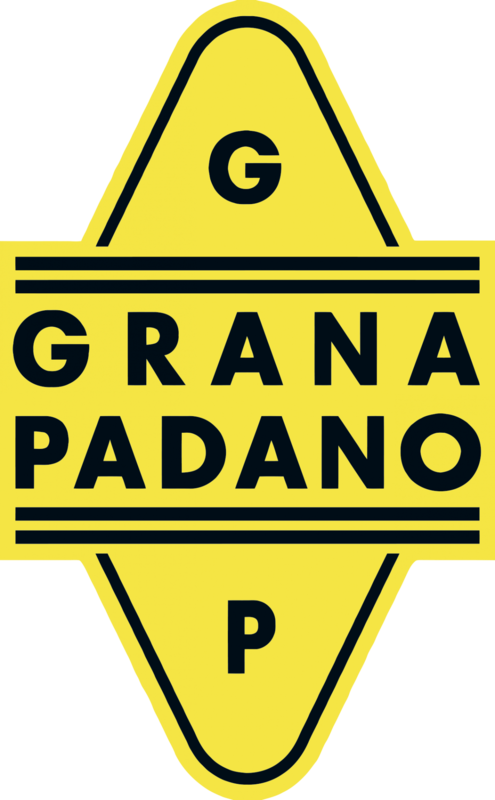 Aside from its full flavour and characteristic granular texture (grana means grainy in Italian), only those cheeses that pass the Grana Padano Protection Consortium's strict quality tests are fire branded with its unique diamond-shaped mark. This signifies the cheese's quality and coveted Protected Designation of Origin (PDO) status: quite simply, if the PDO branding isn't on the rind or the packaging, it's not Grana Padano. Grana Padano is a wise choice if you're catering for different diets this Christmas. 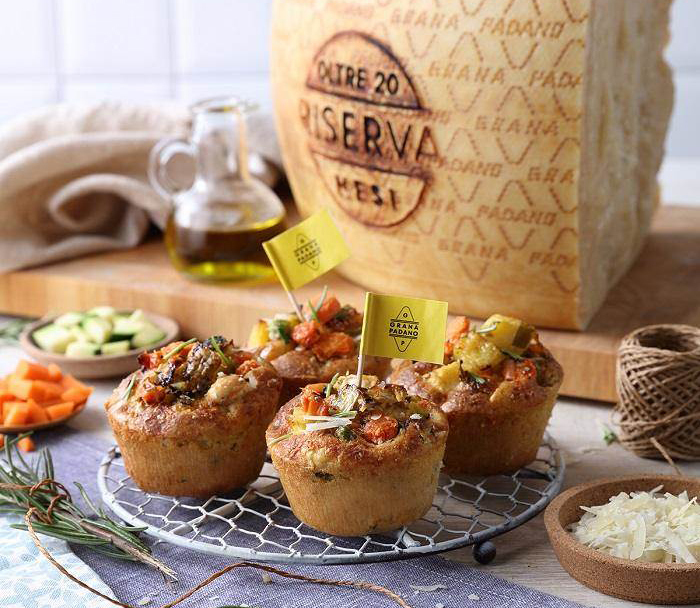 Due to the way it's made, and the long ageing process (minimum of 9 months to over 20 months for the very finest Riserva), it's naturally lactose free. And because it's made from partially skimmed milk, it's lower in fat than many of Italy's other famous cheeses. It's packed with protein, too, and it's a natural source of zinc, calcium and other important minerals, plus Vitamins A, B2 and B12, making this sensational-tasting cheese a truly guilt-free pleasure. It's also good to know that the consortium behind Grana Padano takes animal welfare and environmental sustainability seriously. Its members know that the key to consistently excellent cheese is high-quality milk - and that comes only from healthy, well-kept cows, reared to exacting standards. Look out for the new 'II nostro latte' (Our Milk) logo - it's your guarantee of quality, origin and full traceability. If you're planning to host a drinks party, entertaining friends or spending quality time with family this Christmas, Grana Padano have a recipe for every occasion to help you glide through the festive season. To make the dough, soak the bread in the milk and squeeze it to remove excess milk. Then put all the dumplings ingredients in a food processor and mix. Let the dough rest for 10 minutes. Then make 40 small balls of dough, and carefully put them in a pan of hot oil (160°) frying in batches of 10 until they are gold. For the dip, blend the avocado in a food processor with the Tabasco, mustard, Worcester sauce, lemon juice, salt and pepper until creamy. Pour into a bowl then top with the chopped red chilli. 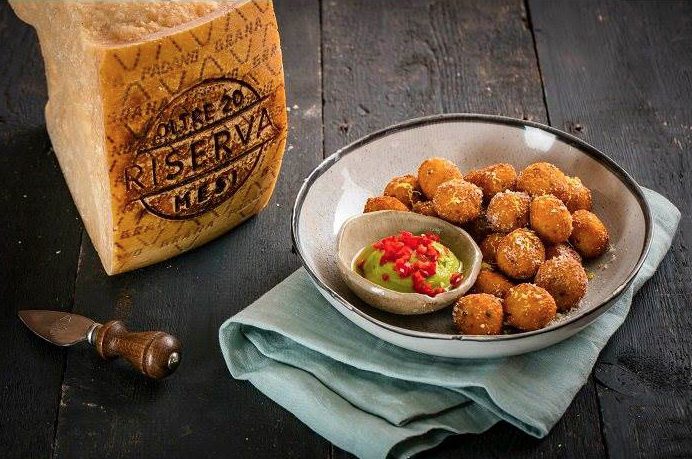 Serve the dumplings garnished with grated Grana Padano Riserva and lemon zest with the avocado dip on the side. Place the muffin tins on a baking sheet, fill them two thirds of the way and bake in a pre-heated oven at 180°C for 20-25 minutes. Pre-heat the oven to 180°C/Gas Mark 4. Line two baking sheets with parchment and set aside. Dust a work surface with a fistful of grated Grana Padano. Unroll one sheet of puff pastry on top of the cheese and scatter its surface with additional grated cheese. Using a rolling pin, roll the pastry out so that it becomes thinner and the cheese sticks to it. Next, fold the pastry in half and top its folded side with more grated cheese. Roll it out to its original thickness and then cut it into strips, about 2cm wide and 10-12cm long. Gently transfer each strip to one of the baking sheets, making sure to space them about 2.5cm apart (they'll expand while baking). Scatter chopped pistachios all over each strip. Twist the ends of the pastry strip in opposite directions to create a sort of twirl (if some pistachios fall off in the process, press them back in). Chill this first batch of straws. Repeat the same process with the second sheet of pastry. Once finished, place the second batch of straws in the fridge and move the first batch into the oven. Bake for 15 minutes, or until deeply golden and puffed. Remove from the oven and cool on a rack. Repeat with the second batch. Serve the straws as soon as they are cooled or within a few hours of baking. 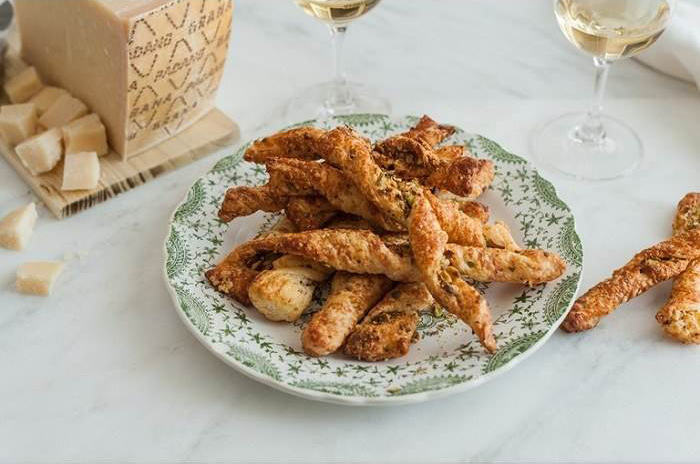 They work well with both beer and/or dry or sparkling white wine.